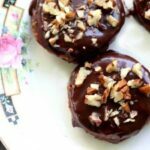 Easy no bake cookies made with Ritz crackers and Rolo chocolate and caramel candies that are dipped in chocolate and topped with chopped pecans. Lay 12 Ritz crackers on a microwave safe dish. Add 1 Rolo to the center of each. Gently press the remaining Ritz Crackers on top of the softened Rolos to make a sandwich. Refrigerate while melting the chocolate. Melt the chocolate chips in the microwave stirring ever few seconds until smooth. Dip the Ritz sandwiches into the chocolate covering completely. Sprinkle on the pecans while the chocolate is still melty. Chill until the chocolate is set.